That incomparable, enchanting and irresistible character, Auntie Mame, is kicking up her heels once again in a spectacular production of Jerry Herman’s “Mame” at the Goodspeed Opera House. Goodspeed, with two Tony Awards to its credit, is the unrivaled champion of reviving, restoring, and breathing new life into favorite musicals of the past. With “Mame” they have truly outdone themselves. It is a glorious production. Heading a matchless cast is Louise Pitre, in the title role, and she is incredible. From her entrance and that first blast on the trumpet, Pitre delivers every favorite number and every measure of humor and tenderness called for. She is sensational. Director Ray Roderick has found an ideal cast for this revival. In addition to Pitre’s Mame, Judy Blazer portrays a marvelous Vera Charles. When these two join forces for their Act II, "Bosom Buddies" duet, they deservedly stop the show. As young Patrick Dennis, Eli Baker is a heart-stealing winner, portraying the character with charm and humor. As the grown-up Patrick, Charles Hagerty glides over the hurdles of maturing and growing and performs a moving reprise of "My Best Girl." James Lloyd Reynolds' Beauregard Burnside is the epitome of a genteel Deep South aristocrat, loaded with charm and money. Kirsten Wyatt, from her entrance "Hymn to St. Bridget" to "Gooch’s Song," is non-stop hilarious. After learning to “live,” with guidance from Mame, her charactor of Agnes appears to virtually levitate like a hot air balloon, to the delight of the audience. “Mame” provides a cornucopia of toe-tapping numbers. Starting with "It’s Today," each number has the audience cheering. Following in quick succession are "Open A New Window," "We Need A Little Christmas," the knock their socks off title song. Plus, "That’s How Young I Feel" and Pitre’s moving treatment of "If He Walked Into My Life Today." 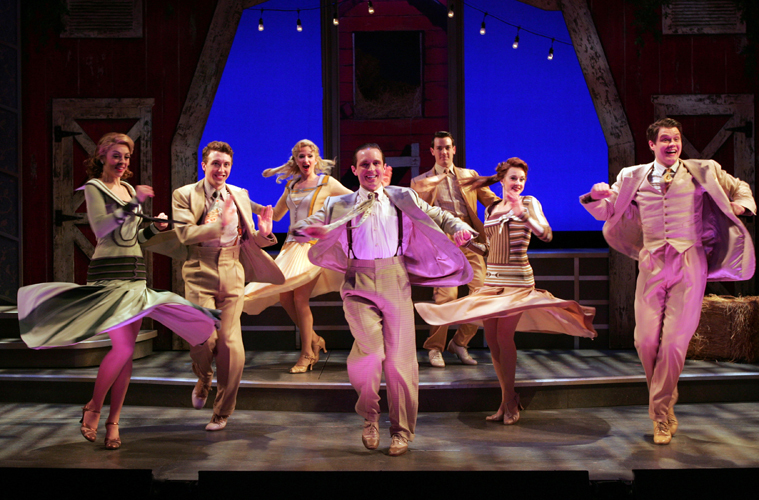 Choreography by Vince Pesce captures the frothy spirit of the 1920's and 30's, as do the elegant scenic designs of James Youmans and the gorgeous costumes of Gregg Barnes. This production could easily make the transition direct to Broadway intact. It certainly deserves to make that journey.